Summary: Thirty-six-year-old Gal Garner lives a regimented life. Her job teaching biology and her struggle with kidney disease keep her toggling between the high school, the hospital, and her home on a strict schedule. Only at home, in her garden, does Gal come alive. It's here that she experiments with Hulthemia roses, painstakingly cross-pollinating various specimens in the hopes of creating a brand-new variation of spectacular beauty. But even her passion has a highly structured goal: Gal wants to win Queen of Show in a major competition and bring that rose to market. Then one afternoon Gal's teenaged niece Riley, the daughter of her estranged sister, arrives. Unannounced. Neither one of them will ever be the same. 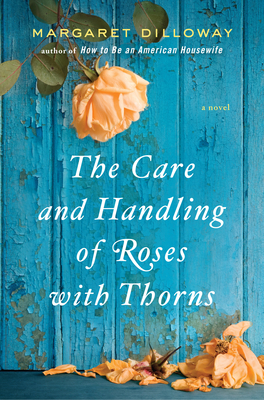 I admit that I was pretty excited when I received a copy of THE CARE AND HANDLING OF ROSES WITH THORNS by Margaret Dilloway. I enjoyed her debut novel HOW TO BE AN AMERICAN HOUSEWIFE (you can read my review here), and I had seen some outstanding reviews by many well-respected bloggers for this one. After reading this novel in less than a 24 hour period (I was at the beach! ), I have to say that I liked THE CARE AND HANDLING OF ROSES WITH THORNS (from now on to be known as TCAHORWT) as much, if not more, than HOW TO BE AN AMERICAN HOUSEWIFE. Throughout much of TCAHORWT, Gal lives a pretty solitary existence with everything just the way she wants it. She has few friends and she's pretty judgmental of others. Truthfully, the only sign of her "humanness" is her passion for her rose garden; and she spends countless hours trying to create a new rose specimen. I would probably go so far as to say that Gal is obsessed with her roses and her desire to win Queen of Show in a major competition. It's probably no surprise that someone like Gal is estranged from her carefree (and careless) sister. However, when her teenage niece Riley shows up and needs a place to stay, Gal agrees takes her in. Naturally, Riley "disrupts" Gal's structured lifestyle, and Gal doesn't like it when things aren't just-so; however, Riley also manages to bring some things to Gal's life that make it better -- things Gal didn't even realize she was missing. Initially when I started TCAHORWT, I wasn't quite sure I was going to have the same positive reaction to it that so many other bloggers did. While I immediately felt comfortable with Ms. Dilloway's writing style, I wasn't so sure that I was going to like a book about Gal. Frankly, she annoyed the heck out of me (maybe because I know someone an awful lot like her! ), and I thought her oddities and negativity were going to drive me crazy. I wasn't quite sure I could stand her for close to 350 pages. Gal was portrayed as over-the-top, and if I didn't know someone just like her, I might have thought she was a tad bit unrealistic. In many ways, my feelings towards Gal were similar to how I felt about the character of Olive Kitteridge. She was rough around the edges and pretty hard to take, but I just knew there was something buried deep inside her that wasn't all bad. I just had to have faith that Gal would evolve -- allow herself some room for flexibility and ultimately find some happiness. But in the meantime, her condescending nature and her treatment of others was difficult for me to swallow! Having said all of that, I think maybe my intense dislike of Gal is what ultimately made this story so special to me. Eventually Gal's hard exterior did crack and she became much more likable; and then I began feeling pity towards her. It's not that I didn't feel some sympathy from the start for her having to deal with the kidney disease, but eventually I saw just how much she feared life and living because of this. She basically cut herself off from almost everyone and everything... except for her roses; and then I realized that her situation just broke my heart! Another really special aspect of TCAHORWT was how the author incorporated the theme of roses into the story. Some of the symbols and metaphors were rather obvious, but there were also ones that were less so. Ms. Dilloway managed to write some beautiful prose about the breeding and tending of roses, and I actually appreciate how she even brought the competition angle to life in this novel. Having known next to nothing about rose competitions or breeding, I found it all to be very interesting. TCAHORWT would make a fantastic book club pick. Naturally, Gal and the other characters are interesting and worthy of some additional discussion. I wasn't able to find a formal discussion guide yet, but I think most groups will not be lacking in things to discuss. Some of the topics you might want to explore include family dynamics, illness, caretaking, mother/daughter relationships, the role of teachers, forgiveness, love, sacrifice, and redemption. I thoroughly enjoyed TCAHORWT and think that fans of women's fiction will adore this book too! Highly recommended! Beautiful cover. This is one for my list. Thanks for the review! I hope I'm not the person who's like Gal! I haven't read the book yet but, from your description, I think I know someone like that too. This sounds really good! I thought you'd really like this one. Love the cover on this one! Sounds like the contents match up to it too! Great review, Julie. I'm hoping to read this one soon! I've been curious about this book because I loved her first novel. You've made me curious about the characters. Sounds like a lovely read, another for my wishlist!